Welcome to the Paintball Equipment website! 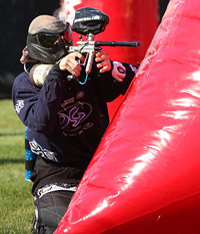 Welcome to the Paintball Equipment website. Browse through our paintball equipment product catalogue or visit one of our stores. Paintball is a competitive game that is challenging as it has hide-and-seek elements in it. There are different strategies when playing the game such as being sneaky and quiet and choosing your shots carefully, to being fast, loud and constantly shooting. Certain safety equipment needs to be worn in the game such as special clothing and goggles. An important element in the game is the paintball itself. There are dozens or hundreds of balls which are really tiny containers of paint. The balls are simple and quite similar to bath oil beads. The may be made of coloured liquid which is encased in a gelatin shell and are available in different colours which are water-soluble, non-toxic and biodegradable. The weight of the paintballing sphere is identical to that of a tiny water balloon, typically weighing in at a couple of grams. The shell retains its shape if you drop it from a short height. Once the ball is shot from a gun however, it bursts upon impact, thus leaving a spatter of paint. The paintball gun is also known as a marker and it is aimed to shoot the ball at high speed. The propulsion system in the gun makes use of compressed CO2 gas, ordinary air and nitrogen in large or small tanks which are attached to the gun. If you would like to discuss Paintball Equipment, please feel free to get in touch.